of J Wakefield Brewing Co.
Johnathan Wakefield started as your average homebrewer, down to the homebrew kit present from his wife. 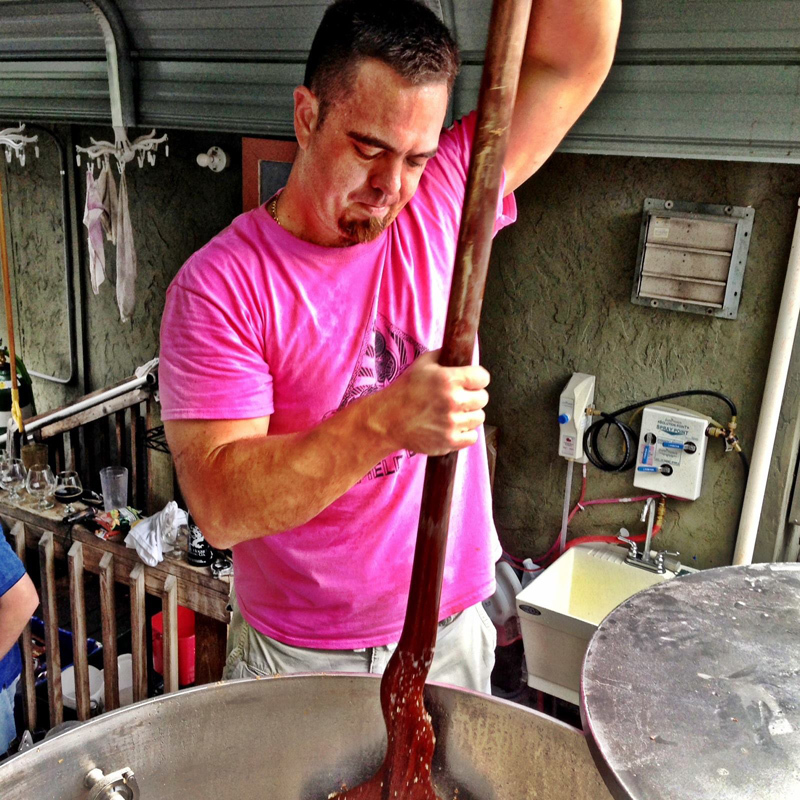 But his homebrews became a Florida phenomenon, particularly his “Florida Weisses,” tart wheat beers with tropical fruit twists (because what is woodruff anyway?). After collaboration brews, including with his mentors at Tampa’s Cigar City Brewing, Wakefield launched the most successful crowd-funded brewery project, more than doubling his $55,000 ask for J Wakefield Brewing. AAB: A lot of weird stuff comes out of Florida, but lately it seems that good craft beer hails from there, too. Has it taken a long time, or is everyone else just discovering it? JW: It has taken the state a while to catch up. I have watched the growth of the craft beer scene in Miami. It is still a ways behind the likes of San Diego and even Tampa, but don’t count us out. My first objective is to try and boost Miami’s profile because it is my hometown. So let’s talk Florida-Weisses. How do you design them and go about selecting the fruit you work with. Basically the Florida Weisse is a spin on the classic Berliner Weisse just in a brand-new form. It is typically a 50 percent wheat and 50 percent two-row mash bill, but instead of adding fruit syrup to the glass, we add fruit in the fermentation process. I typically use my culinary skills to pair the fruits that I think would work best. The reaction from beer fans is across the board. For some, it’s too sour, but for most people they love the balance of sweet and sour. My Miami Madness [with guava, passion fruit and mango] was the beer that caught Greg Koch’s attention and spawned a collaboration between Stone and JWB. How did you become involved with Cigar City? I use to drive from Miami to Tampa for every bottle release that they had when they first started. I developed a relationship with [Cigar City founder] Joey Redner. From that, he and [vice president] Justin Clark asked me to come up and brew on their pilot system and pour those beers at the first Hunahpu’s Day [the release day for Cigar City’s imperial stout], which is where Dragon Fruit Passion Fruit Florida Weisse was first released. I can’t thank those guys enough for allowing me to intern with them. I don’t think you could pay for the amount of knowledge that I garnered while I was there. With hundreds of craft breweries opening each year now, what are the biggest challenges entering the market? Was that the impetus for starting a commercial brewery in the first place? There are always challenges for a new business, but the craft beer market is wide open and in need of more craft breweries. So, I hope more will open in the Miami market to help us grow a great beer scene. It really was the beer fans, friends and family that helped me make the decision to open. I was on the fence for a while, but they were the ones that really convinced me I could do something good for the Miami beer scene. OK, CrowdBrewed.com? How did you hear about it since it’s so new and there are two better-known crowd-funding sites. Were you worried about successfully hitting $55,000? Actually (CrowdBrewed) introduced themselves to me at the West Palm Beach Beerfest in 2013. I was going to go with Kickstarter, but [CrowdBrewed founder] Travis [Benoit] convinced me otherwise. I liked the idea that it was a beer-industry-specific crowd-funding platform. Of course I was worried that I would not hit the $55,000 within 45 days. The backup was going to be trying to find equity investors if the crowd funding did not work. I never dreamed that it would ever double my goal or that we would hit $55,000 in less than 48 hours. It still blows me away at the amount of support that was out there. Now that you have pulled off the largest successful brewery project in crowd-funding history, how many folks have come out of the woodwork bombarding you with questions and asking for tips? More than a few. I normally tell them that … the beer community is very supportive and that they need to put together a good campaign to drum up interest and to reach the goals. Lastly, when will beer from your own brewery be available? How many collabs do you have on the market already? And what can folks look forward to, both beer-wise and visiting-wise? We are looking to open in April and have our beer in the market by then. I have done five collabs to date: two with CCB, two with Cycle Brewing [in St. Petersburg] and one with Stone. We have five more in the works, so 2014 is going to be a good year for JWB fans. We are going to have four flagship beers and one constant, Florida Weisse. We’ll have a tasting room at the brewery so we’ll welcome one and all. This article appears in the May issue of All About Beer Magazine. Click here for a free trial of our next issue.